Making a budget is a key piece of a strong financial foundation. Having a budget helps you manage your money, control your spending, save more money, pay off your debt, or stay out of debt. Without an accurate picture of what's coming into and going out of your bank account, you can easily rely on credit cards and loans to eat and pay your bills. If you already have one, now's a good time to update it. Using a worksheet will help you get started. You can use it to complete all the steps below. You can also create your budget worksheet using spreadsheet software or even paper an pen. Add up all reliable sources of income - wages from a job, alimony, child support, etc. Notice we say reliable. If you sometimes get cash from outside jobs or hobbies, but it's not on a regular basis, don't put this down as income on your budget. Your budget should be a document you can depend on. If you're self-employed or have a fluctuating income, use an average monthly income or an estimate of the income you expect to receive that month. Some of your monthly expenses are fixed - mortgage/rent, property taxes, child support, alimony - while others may vary - electricity, water, groceries. List all the fixed expenses and the amount of the expense. For your variable expenses, write the maximum amount you plan to spend in that category or the amount you expect your bill to be. For example, you might plan to spend $200 on groceries and $150 on gas. Use your bank statements to help you figure out what you typically spend each month and to make sure you're not leaving out spending in any categories. Some of your expenses don't occur each month. 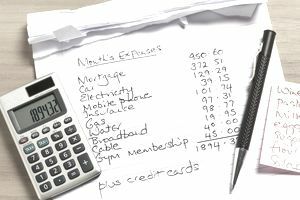 But, accounting for those periodic expenses in your monthly budget can make it easier to afford them when they're due. Divide yearly expenses by 12 and semi-annual expenses by 6 to come up with the monthly amount to spend in those categories. Your net income is what you have left over after all the bills are paid. You want this to be a positive number so you can put it toward your debt. Calculate your net income by subtracting your expenses from your monthly income. Write down the number, even if it's negative. If your net income is negative, it means you've budgeted to spend more than your income. You'll have to correct this. Otherwise, you'll run into trouble during the month. Variable expenses are typically the first places you can adjust spending, e.g., groceries, eating out, hobbies, gas. Even some of your fixed expenses can be adjusted, e.g., reduce your cable or phone bill, cancel the gym membership, don't take a vacation this year. Evaluate your spending using a "wants vs. needs" analysis. Reduce or eliminate spending in those "want" areas to make more room for the things you "need" to spend money on. Throughout the month, track your actual spending against what you budgeted. If you go over budget, this will help you figure out where you spent more money. In the future, you can take greater care not to overspend in that area. Or, you may need to adjust your budget to compensate for the additional spending. If you increase your budget in an area, decrease it in another area to keep from going over your budget.